President Barack Obama arrived in Washington in 2008 in the midst of one of the nation’s worst financial recessions, with a message of hope and change as an empowering element of advancement for the middle class. Part of that message was an emphasis on higher education reform, with a platform of growing the industry to help the nation reclaim its position as the world’s most prolific in the production of college graduates. The same emphasis on standards and accountability that summarize President Barack Obama’s mark on K-12 education translate to higher education. Over the course of eight years, the Obama Administration has worked to promote affordability, access, cost management and transparency in higher education. 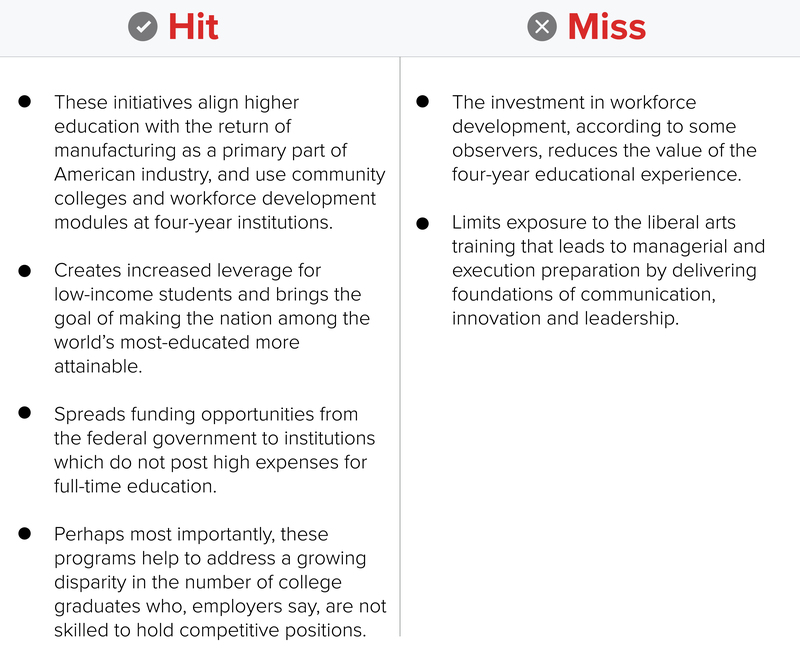 But many of those initiatives have created mixed messages and outcomes for families about the value of education, versus the education as a value add to workforce development. Under former Secretary Arne Duncan, the administration zeroed in on sexual assault and affordability and the idea that college is a fundamental right that should be made available to all students. The administration was a strong proponent for the two-year sector and was the first to propose the idea of free community college. But just as notably, the administration’s support for historically black and minority serving colleges and universities was seemingly non-existent, which seemed to counter the idea of Obama’s strong focus on Civil Rights. 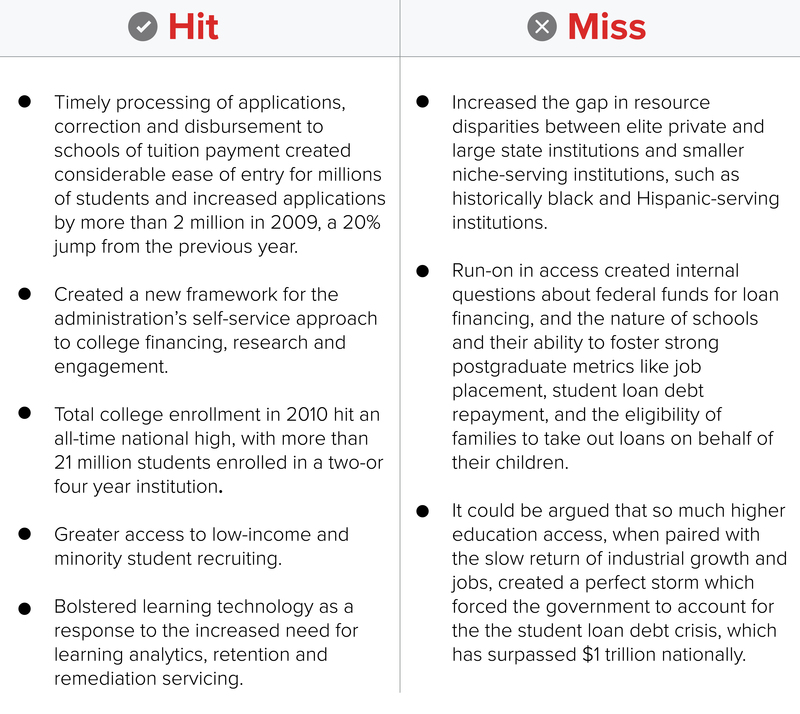 The arrival of John King did not change the direction of the administration’s education policy. But if the Duncan education department is most known for free community college, the college scorecard and student loan reforms, it may be the tying of federal funding eligibility to certain metrics like transgender bathroom access and the decimation of the for-profit sector that marks King’s time in the secretary’s chair. In June 2009, the Department of Education announced its first set of major reforms, beginning with an overhaul of the Free Application for Federal Student Aid. Changes included stronger connectivity to federal tax information, and the removal of 26 questions from the application without significant bearing on potential awards. These changes accompanied increases to the federal Pell Grant program to $5,350 for annual awards; a number that would increase by $500 in the final year of his presidency. In the following year, President Obama signed historic legislation eliminating student loans being offered by private lending institutions, expanding Pell Grant funding, and capping student loan payments to not exceed 10 percent of annual income. The Pell Grant funding, which earlier this year was expanded to include incarcerated learners, is expected to approach nearly $6,000 in 2017. The administration’s single biggest effort on affordability came in January 2015, when President Obama proposed a plan to make community college free for all students meeting certain academic goals, and for states opting in to subsidize 25% of the total tuition costs. That plan, which has undergone significant changes under Democratic presidential nominee Hillary Clinton version of the proposal, factors to be a lingering element of the Obama Administration’s legacy on higher education that will transition to become a point of emphasis for the next president. Months later, ED officials announced a new plan to pilot financial aid assistance for more than 1.5 million incarcerated students who will be eligible for release in five years. The program was launched to aid in reducing criminal recidivism, and to bolster workforce development in trade and technical related fields. In June 2010, the Department of Education made some of its earliest and strong statements on the credibility of degree programs. The Notice of Proposed Rulemaking emphasized review and certification of high school programs which granted diplomas or early college credits, but also included language about for-profit and proprietary schools using predatory methods of marketing, which were not fulfilled and creating heavy student loan debt loads for millions of students. In March 2011, the administration debuted its College Toolkit, one of the first public views of federal recommendations to states on how to address rising costs, historic social disparities and workforce development in higher education. This document, which offered statistical analysis of job placement, earnings, the importance of community college in supporting students who would not be admitted to four-year degree programs, and the growing number of adult learners, was a foundational document for several ED initiatives that would draw national attention in President Obama’s second term. This notice began an all-out pursuit of for-profit institutions, which drew congressional scrutiny during the same year for receiving billions in federal student loan disbursements, but also posted some of the nation’s worst outcomes in graduation rates and job placement. In June 2014, officials announced plans for increased review of Corinthians Colleges, one of the nation’s largest for-profit education companies. Citing repeated requests for documentation verifying job placement and recruiting information, the school placed the company on heightened cash monitoring and required it to wait 21 days after student enrollment data submission to withdraw financial aid. The move essentially bankrupted the college and created a blueprint for dismantling the for-profit sector. Between April 2015 and September 2016, Corinthians and ITT Technical Institute closed their doors under pressure from the Department of Education created by financial penalties, enrollment prohibitions and forced disclosures to students about their status with the federal government. But in the preceding years, the Obama Administration’s commitment to transparency grew with its 2013 introduction of the college scorecard, an online tool designed to help families compare institutions based upon metrics like annual costs, graduation rates, loan default rates and job placement. 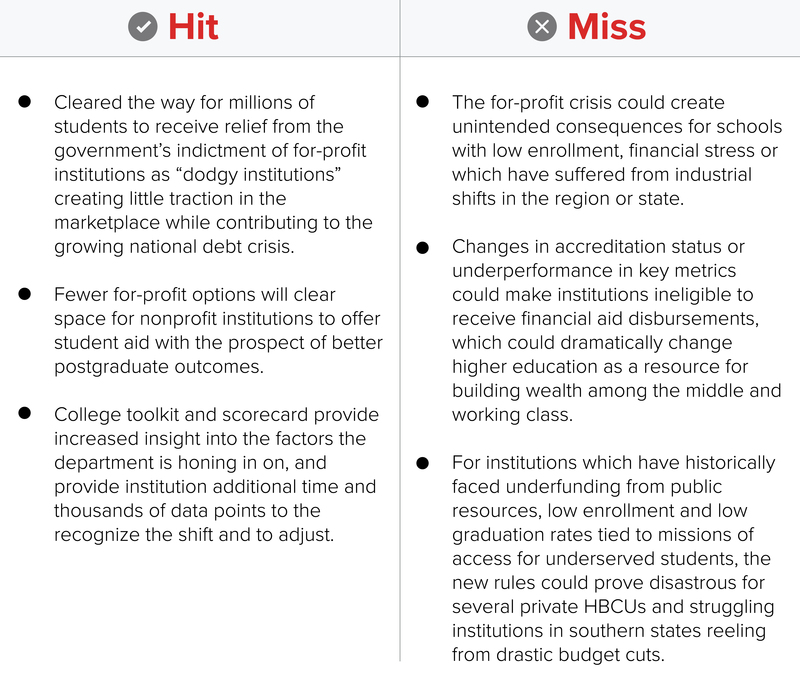 Six months later, the president discussed plans to debut a federal ranking system for colleges based heavily upon data organized in the scorecard. The plan, after intense criticism from colleges and universities nationwide was scrapped in 2015. President Barack Obama delivered the commencement speech at Morehouse College in May 2013, and created national dialogue about the role and view of black men from the White House. With remarks touching on themes of black men ‘not making excuses,’ avoiding cynicism and working to be better fathers, it was among the most prominent examples of Obama revealing personal views of race and responsibility, and the first instance of a perceived habit of chiding black people in public black spaces. To many, the Obama Administration head-first approach to speaking about cultural issues was among the most covered and discussed elements of its higher education legacy. But for many, his usage of the college platform was the beginning of sharp criticism from some presidents and advocates, who used the Morehouse speech as the foundational element of years of underfunding, neglect and criticism of HBCUs from the Obama White House. From a lack of engagement with the White House Board of Advisors on HBCUs, to dismissal of Congressional Black Caucus members on the subject of HBCUs, many would regard relationship with black colleges, in the best of descriptions, as complex; in the worst, hostile. In May 2014, the Department of Education revealed a list of dozens of institutions under investigation for potential Title IX violations stemming from sexual assault cases. Spurred by student complaints to the department of improper or non-response to sexual assault allegation, or compliance reviews launched by the department, the release promoted promoted a national movement of students sharing stories of institutional failures in sexual assault response. In September 2011, the U.S. Department of Labor and Education jointly announced the awarding of $500 million in funding for community colleges to implement distance learning and on-campus support mechanisms for students pursuing credentialing in trade and technical careers. It remains one of the largest rounds of financing for colleges and universities over the course of the Obama Administration, and was the single biggest initiative designed to jumpstart workforce development as a central theme for the department’s vision for education in the 21st century. Four years later, the administration announced a new initiative to pair colleges with for-profit institutions to offer courses to low-income students for professional credentials and degrees in manufacturing and tech jobs. Schools were chosen and charged with guaranteeing access to affordable academic and technical curriculum, and protections for students.